Vegetables that grow under the ground, or root vegetables, are annual plants and grow anywhere. Root vegetables love the cold to the point where they are only planted in the winter in the south. Hot southern summer months can diminish the quality of the crops. All root vegetables need the same soil requirements and can stand up to full sun. Beet (Beta vulgaris) produces dark-green leaves that emerge from the base of the plant and grow from 4 to18 inches long and turn red. The flower stalk appears in the second year and grows up to 4 feet tall, producing green or red petal-less flowers. Sugar beets produce white roots that weigh from 6 to 15 lbs. Table beets produce red, yellow, orange, white, pink or striped roots in a variety of shapes. Plant beets in full sun or partial shade and a moist soil that is not allowed to go completely dry. Beets grow in all parts of the United States. In the far South, beets grow in the winter. Rutabaga (Brassica napus) is an annual that grows from 2 to 4 feet tall producing blue-green, flat leaves that grow from 12 to 20 inches long and 8 to 15 inches wide, yellow cross-shaped flowers and sickle-shaped seed pods. Plant rutabaga in full sun and a moist soil. Harvest the corp in about 90 days. The vegetable is grown in the spring and summer in the north and in the winter in the south. White potato (Solanum tuberosum) grows like a vine up to 3 feet tall and more in width. The plant produces compound leaves made up of seven to 15, 3-inch-long leaflets that grow to 10 inches long, and star-shaped flowers with white, lavender, pink or light blue petals and a yellow center that measure 1-inch across. The flowers are followed by small green fruits. The tuber is the only part of the plant that is edible. The fruits, leaves and stems are poisonous. Plant potatoes in full sun and a moist, well-drained soil. Potatoes can be planted early in the spring before the danger of frost has passed. Carrot (Daucus carota var. sativus) produces triangle-shaped lacy leafs that grow up from 1 to 2 feet tall. The plant will produce tiny white flowers growing in clusters if it is left in the ground for a second season. The edible root grows from 2 to 36 inches long, depending on the variety. 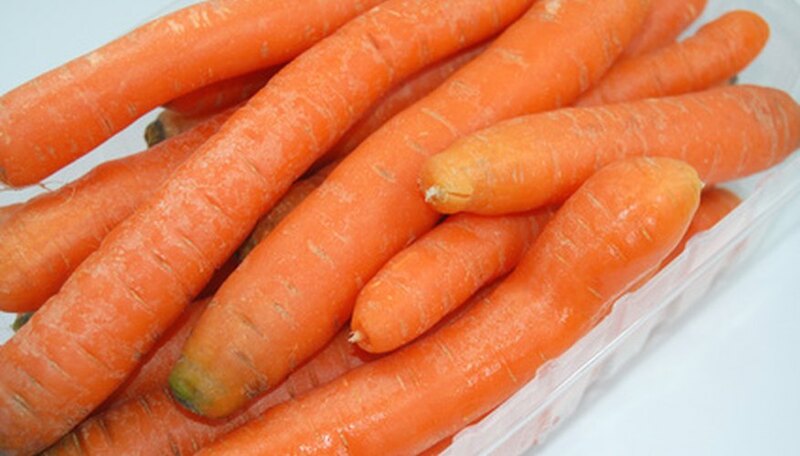 Plant carrots in full sun or partial shade and a moist soil. Carrots are cold hardy, able to stand up to frost and stay in the ground in the north over the winter as long as the plants get a good mulch.